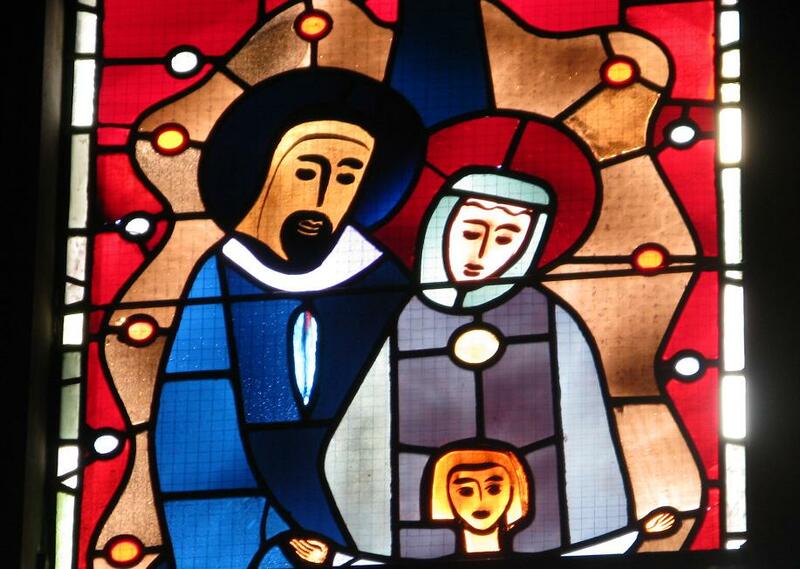 Taken from the 2009 homily for the Feast of Saint Joseph, Husband of the Virgin Mary, given in Yaoundé Cameroon. Our Gospel reading recalls this for us. The angel said to Joseph: “Do not be afraid to take Mary your wife into your home,” (Mt 1:20) and that is precisely what he did: “he did as the angel of the Lord had commanded him” (Mt 1:24). Why was Saint Matthew so keen to note Joseph’s trust in the words received from the messenger of God, if not to invite us to imitate this same loving trust? Joseph trusts God when he hears his messenger, the Angel, say to him: “Joseph, son of David, do not be afraid to take Mary your wife into your home. For it is through the Holy Spirit that this child has been conceived in her” (Mt 1:20). Throughout all of history, Joseph is the man who gives God the greatest display of trust, even in the face of such astonishing news. Dear fathers and mothers here today, do you have trust in God who has called you to be the fathers and mothers of his adopted children? Do you accept that God is counting on you to pass on to your children the human and spiritual values that you yourselves have received and which will prepare them to live with love and respect for God’s holy name? At a time when so many people have no qualms about trying to impose the tyranny of materialism, with scant concern for the most deprived, you must be very careful. Do not let yourselves be captivated by selfish illusions and false ideals! Believe – yes! – continue to believe in God – Father, Son, and Holy Spirit – God alone truly loves you in the way you yearn to be loved, God alone can satisfy you, can bring stability to your lives. Only Christ is the way of Life. God alone could grant Joseph the strength to trust the Angel. God alone will give you, dear married couples, the strength to raise your family as he wants. Ask it of him! God loves to be asked for what he wishes to give. Ask God for the grace of a true and ever more faithful love patterned after his own. As the Psalm magnificently puts it: God’s “love is established for ever, his loyalty will stand as long as the heavens” (Ps 88:3). The first priority will consist in restoring a sense of the acceptance of life as a gift from God. According to both Sacred Scripture and the wisest traditions of Africa, the arrival of a child is always a gift, a blessing from God. Today it is high time to place greater emphasis on this: every human being, every tiny human person, however weak, is created “in the image and likeness of God” (Gen 1:27). Every person must live! Death must not prevail over life! Death will never have the last word! “Hoping against hope”: is this not a magnificent description of a Christian? Africa is called to hope through you and in you! Each and every one of us was thought, willed and loved by God. Each and every one of us has a role to play in the plan of God: Father, Son and Holy Spirit. If discouragement overwhelms you, think of the faith of Joseph; if anxiety has its grip on you, think of the hope of Joseph, who hoped against hope; if exasperation or hatred seizes you, think of the love of Joseph, who was the first man to set eyes on the human face of God in the person of the Infant conceived by the Holy Spirit in the womb of the Virgin Mary. Let us praise and thank Christ for having drawn so close to us, and for giving us Joseph as an example and model of love for him. Once more, I wish to extend a particular word of encouragement to fathers so that they may take Saint Joseph as their model. He who kept watch over the Son of Man is able to teach them the deepest meaning of their own fatherhood. In the same way, each father receives his children from God, and they are created in God’s own image and likeness. 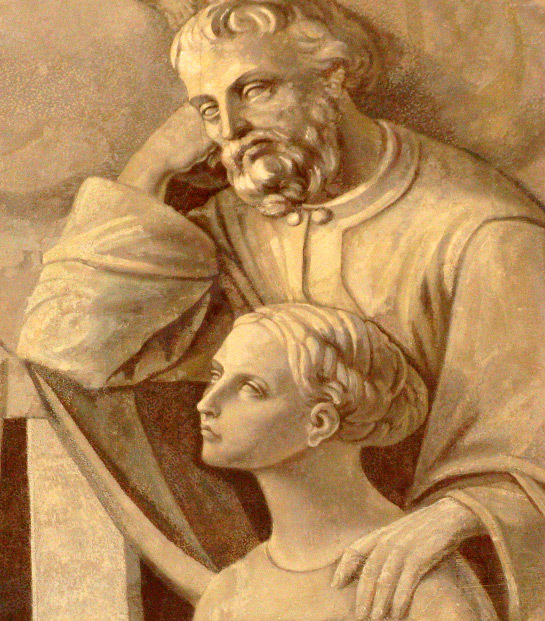 Saint Joseph was the spouse of Mary. In the same way, each father sees himself entrusted with the mystery of womanhood through his own wife. Dear fathers, like Saint Joseph, respect and love your spouse; and by your love and your wise presence, lead your children to God where they must be (cf. Lk 2:49). 1. “Here is the wise and faithful servant, whom the Lord has put in charge of his household” (cf. Lk 12: 42). This is how today’s liturgy presents St Joseph, Husband of the Blessed Virgin Mary and Guardian of the Redeemer. He was the wise and faithful servant who, with obedient docility, accepted the will of the Lord, who entrusted him with “his” family on earth to watch over it with daily devotion. St Joseph persevered in this mission with fidelity and love. The Church, therefore, offers him to us as an exceptional model of service to Christ and to his mysterious plan of salvation. And she calls upon him as the special patron and protector of the whole family of believers. 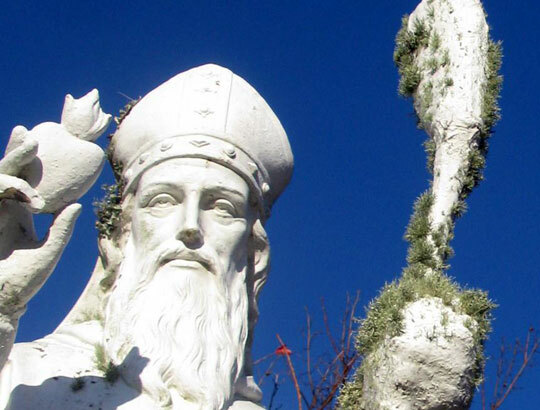 In a special way, Joseph is presented to us on his feast day as the saint under whose powerful protection divine Providence has wished to place the persons and ministry of all who are called to be “fathers” and“guardians” among the Christian people. 2. “”Behold, your father and I have been looking for you anxiously’…. “How is it that you sought me? Did you not know that I must be in my Father’s house?‘” (Lk 2: 48-49). In this simple, family conversation between Mother and Son, which we heard a few moments ago in the Gospel, we find the characteristics of Joseph’s holiness. They correspond to God’s plan for him, which he, being the just man that he was, would fulfil with marvellous fidelity. “Your father and I have been looking for you anxiously“, Mary said. “I must be in my Father’s house“, Jesus replies. It is precisely these words of the Son that help us to understand the mystery of Joseph’s “fatherhood“. In reminding his parents of the primacy of the One whom he called “my Father”, Jesus reveals the truth about Mary’s and Joseph’s role. The latter was truly Mary’s “husband” and Jesus’ “father”, as she affirmed when she said: “Your father and I have been looking for you”. But his being a husband and father is totally subordinate to that of God. 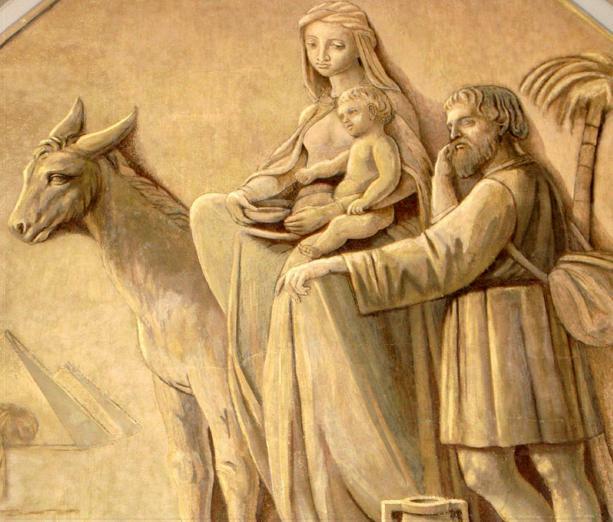 This is how Joseph of Nazareth was called, in turn, to become one of Jesus’ disciples: by dedicating his life to serving the only-begotten Son of the Father and of his Virgin Mother, Mary. It is a mission that he continues to carry out for the Church, the Mystical Body of Christ, to which he never fails to give his provident care, as he did for the humble family of Nazareth. I only beg, for the love of God, that anyone who does not believe me will put what I say to the test, and she will see by experience what great advantages come from her commending herself to this glorious patriarch and having devotion to him. Those who practice prayer should have a special affection for him always. I do not know how anyone can think of the Queen of the Angels, during the time that she suffered so much with the Child Jesus, without giving thanks to Saint Joseph for the way he helped them. If anyone cannot find a master to teach her how to pray, let her take this glorious saint as her master and she will not go astray. I almost posted this without commentary as an act of penance, but I am also working on being less confusing for the poor souls who stagger by my blog expecting it to be normal. Saint Josemaría is, in fact, a Saint. Yes, some of his devotees are significantly less than Christlike. But good should be appreciated, regardless of how much evil surrounds it. Just like evil should be eliminated, no matter how much good surrounds it. That said, enjoy this clip. It is good. Fr. James Martin, S.J. explains why you should care about Joseph. Agnes is one of my patron Saints. I used to joke that I was her most disrespectful devotee as, for instance, I would think that one of the medals I wore looked like a Roman soldier holding a monkey. And really, who goes around holding lambs all the time anyway? I love Agnes, perhaps because we have precisely nothing in common. She represents the ultimate in virginal purity that “is too young to know of death, yet is ready to face it.” I, on the other hand, have never been a virgin, and was perhaps born without the innocence which most are given despite original sin. Agnes is one of the ultimate mythical Saints, not so much in the sense that her individual story is historically questionable (um, did anyone mention that she was a young girl?) but that in that she represents one unsullied, undiluted ideal. She is Virgin: not simply a virgin martyr, but a virgin martyr par excellence of whom we know no human details to embellish, or distract from her one outstanding virtue. The crowds marvel at her recklessness in throwing away her life untasted, as if she had already lived life to the full. Agnes tells me that God alone matters, and that is all. She offers innocence to intercede for my dejected cynicism. She scorns all the powers of men as she simply choses God. She holds Jesus in her arms with no concern for how others understand it. The Lamb dwells within her, she will not falter. I have planned for months for today’s post. But it is not to be, at least not today. So instead I will simply post a part of Edith Stein’s essay on “The Spirit of St. Elizabeth as it Informed Her Life” and post my thoughts in a few days. We would like to pursue what lies behind the outer facts, to feel the beat of the heart that bore such a fate and did such things, to internalize the spirit that governed her. All the facts reported about Elizabeth reveal one thing, all of the words we have from her: a burning heart that comprehends everything around her with earnest, tenderly adaptable, and faithful love. This is how she put her hand as a little child into the hand of the boy whom the political power struggles of her ambitious parents had given her for her life’s companion, never again to release it. This is how she shared her entire life with the playmates of her early childhood until shortly before her death, when her severe director took them from her to dissolve the last tie of earthly love. This is how in her heart she carried the children she bore when still almost a child herself. And when she gave them up, it was certainly out of a maternal love that did not want them to share her own all-too-hard path, as well as a maternal sense of duty that would not let her take away by her own hands the destiny to which their natural circumstances in life entitled them. But she also gave them up because she felt such overwhelming love that they would have become a hindrance in the vocation to which God was calling her. From earliest youth she opened her heart in warm, compassionate love for all who suffered and were oppressed. She was moved to feed the hungry and to tend the sick, but was never satisfied with warding off material need alone, always desiring to have cold hearts warm themselves at her own. The poor children in her hospital ran into her arms calling her mother, because they felt her real maternal love. All of this overflowing treasure came from the inexhaustible source of the Lord’s love, for he had been close to her for as long as she could remember. When her father and mother sent her away, he went with her into the far-away, foreign country. From the time that she knew that he dwelt in the town chapel, she was drawn to it from the midst of her childhood games. Here she is at home. When people reviled and derided her, it was here that she found comfort. No one was as faithful as he. Therefore, she had to be true to him as well and love him above everyone and everything. No human image was permitted to dislodge his image from her heart. This is why strong pangs of remorse overwhelmed her when she was startled by the little bell announcing the consecration, making her aware that her eye and her heart were turned toward the husband at her side instead of paying attention to the Holy Sacrifice. In the presence the image of the Crucified One who hangs on the Cross naked and bleeding, she could not wear finery and a crown. He stretched his arms out wide to draw to himself all who were burdened and heavy laden. She must carry this Crucified One’s love to all who are burdened and heavy laden and in turn arouse in them love for the Crucified One. They are all members of the Mystical Body of Christ. She serves the Lord when she serves them. But she must also ensure that through faith and love they become living members. Everyone close to her she tried to lead to the Lord, thus practicing a blessed apostolate. This is evident in the life of her companions. The formation of her husband is a persuasive witness to this, as well as the interior change of his brother, Conrad, who after her death, obviously under her influence, entered an Order. The love of Christ, this is the spirit that filled and informed Elizabeth’s life, that nurtured her unceasing love of her neighbors. We can comprehend Elizabeth’s characteristic contagious happiness as arising from the same source. She loved turbulent children’s games and continued to take pleasure in them long after, in accordance with the usual ideas of breeding and custom, she was supposed to have outgrown them. She enjoyed everything beautiful. She dressed very well and put on splendid parties that delighted her guests, as was her duty in her position as a countess. Above all, she wanted to bring joy to the huts of the poor. She took toys to the children and played with them herself. Even the sullen widow whom she had for a housemate during the last part of her life could not dim her enthusiasm and had to be pleased by her jokes. And she was moved by the poor to the depths of her heart on that day when she invited them to Marburg by the thousands and singlehandedly distributed among them the remainder of the widow’s pension that had been given to her in cash. From morning to evening she walked through the rows giving each one a share. As night came on, many remained who were too weak and sick to make their way home. They encamped in the open, and Elizabeth had fires lit for them. This made them feel good, and songs arose around the campfires. Amazed, the countess listened, and it confirmed for her what she had believed and practiced all her life: “See, I told you that all one has to do is to make the poor happy.” That God had created his creatures for happiness had long been her conviction, and she felt it was proper to lift a radiant face to him. And this was also confirmed for her at her death when she was called to eternal joy by the sweet song of a little bird. Overflowing love and joy led to a free naturalness that could not be contained by convention. How could one walk in measured stride or lisp pretentious speech when the signal resounds before the castle gate, announcing the master’s return? Elizabeth forgot irretrievably all the rules of breeding when her heart began beating stormily, and she followed the rhythm and beat of her heart. Again, is one to think about socially acceptable forms for expressing one’s devotion even in church? She could only do what love asked of her, even though it produced strong criticism. In no way could she understand that it was improper to take gifts to the poor herself, to speak with them in a friendly way, to go into their huts, and to care for them in their own homes. She did not want to be stubborn and disobedient and to live in discord with her own, but she could not hear human voices over the inner voice governing her. Therefore, in the long run she could not live among the conventional, who could not and would not release themselves from age-old institutions and deeply rooted ways of thinking about life. She was able to remain among her peers as long as a holy union held her fast and a faithful protector remained at her side, sympathetically taking into consideration her heart’s command while at the same time prudently considering the demands of the surroundings. After the death of her husband, she had to leave the circles into which she was born and raised and to go her own way. It was a sharp and painful separation, certainly for her as well. But with a heart full of love that was stopped by no barriers separating her from her dear brothers and sisters, she found the path that so many today vainly seek, despite their great good will and the exertion of all their strength: the path to the hearts of the poor. Does St. Elizabeth conform to this ideal? The facts presented so far, pointing to her spontaneous way of doing things, seem to say so. But the sources recount other facts that no less clearly point to a will as hard as steel, to a relentless battle against her own nature: The lovely, youthfully cheerful, enchantingly natural person is at the same time a strictly ascetic saint. Early enough she had to recognize that giving oneself over to the pull of one’s heart without restraint is not without its dangers. Extravagant love of her relatives, pride, and greed caused Queen Gertrud to be hated by the Hungarian people, caused her sudden, unexpected death at the hands of murderers. Untamed passion led Gertrud’s sister, Agnes of Meran, into a relationship with the king of France that broke up his marriage and brought ecclesiastical censure to all of France. Reckless political ambition entangled Count Hermann in a lifetime of unremitting warfare and left him to die while excommunicated. From time to time Elizabeth even had to see her own husband involved in unjust power struggles and anathematized. And was even she free of these sinister forces in her own breast? By no means! She knew very well that she, too, could not give herself over to the guidance of her own heart without danger. When, with cunning piety, the child thought up games which would enable her to skip off to the chapel or throw herself down secretly to say her prayers, a mighty tug of grace must certainly have been working in her heart; but she could have suspected, too, that in her play she was also in danger of getting lost from God. This becomes even clearer when the young lady came home from her first dance with a serious face and said, “One dance is enough for the world. For God’s sake, I want to forego the rest of them.” When she arose from her bed at night and knelt to pray or left the room entirely to let the maids whip her, this surely tells us not only of her general desire to do penance and to suffer voluntarily for the Lord’s sake, but that she wanted to save herself from the danger of forgetting the Lord while at her beloved husband’s side. Surely Elizabeth’s natural sense of beauty was drawn to pretty children rather than to ugly ones, and was repelled by the appearance and odor of disgusting wounds. Therefore, since she repeatedly sought out such ailing creatures to tend to them herself, this tells not only of her compassionate love for the poorest, but also of the will to overcome her natural revulsion. Even during the last years of her life Elizabeth prayed to God for three things: for contempt for all earthly goods, for the gift of cheerfully bearing humiliation, and to be free of excessive love for her children. She could tell her maids that she was heard in all of this. But that she had to ask for these things showed they were not natural for her, and that she had probably been struggling for them in vain for a long time. Forming her life to please God Elizabeth strives for this goal not only for herself and in battle against her own nature. With full awareness and the same inflexible determination, she endeavors to influence her surroundings. As countess she takes pains to counteract excesses in sumptuous clothing and to move the titled ladies to renounce this or that vanity. When she begins to avoid all food obtained with illegal revenues and is thus often forced to go hungry at the fully-laden royal table, she assumes that her loyal companions Guda and Isentrud will share her deprivations, as later they will also follow her into the distress of voluntary banishment and poverty. And what a protest this abstention from food was against the whole way of life around her! Her increasingly austere way of life made most severe demands on her husband. He had to look on while she treated herself with the utmost harshness, endangered her health, squandered his wealth lavishly; while, by all this, she roused the opposition of his family and of all at court; and, finally, while she fought to detach herself interiorly from him, even bemoaning bitterly that she was bound by her marriage. All this required heroic self-mastery on his part as well, and one readily understands why, as he accepted everything with love and patience, faithfully taking the trouble to stand by his wife in her striving for perfection, the young count came to be regarded as a saint by his people. Initially, it was probably the doctrine of the Gospel and the general ascetic practices of her time that guided Elizabeth in her striving for perfection. Every now and then she had an insight and sought to put it into practice. When the Franciscans came to Germany, she found what she was looking for, a clearly outlined ideal and complete way of life; and, as her guest on the Wartburg, Rodiger instructed her about the lifestyle of the Poor Man of Assisi. Now suddenly she knew precisely what she wanted and what she had always longed for: to be entirely poor, to go begging from door to door, to be no longer chained by any possessions or human ties, also to be free of her own will to be entirely and exclusively the Lord’s own. When I think of the Litany of the Saints I think of this version. It is one of my favorite songs ever. I would not mind if Mass were three hours long if two of the hours were made up of this. You are the weak heart’s shield and protection. And for nine months lay hidden in a Virgin’s Heart. Your heart was Jesus’ first tabernacle on earth. Were you raised above the choirs of Angels and above all Saints. I give you my soul, my body and my poor heart. Especially at the hour of death, in the final strife.